Tyson branded Fully Cooked Buffalo Style Chicken Strips Chicken Breast Strip Fritters With Rib Meat and Buffalo Style Sauce”, sold in 25-ounce plastic bag packages with a best-if used-by date of NOV 30 2019, case codes of 3348CNQ0317 or 3348CNQ0318 and individual bag time stamps ranging from 17:00 through 18:59 hours (inclusive). Please consult the photograph above for details of the food’s packaging, design and retail presentation. 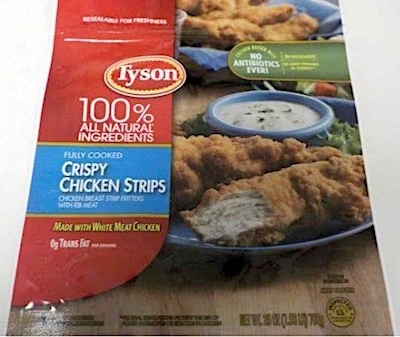 Additional images of the recalled Chicken Strip products can be found on the Web site above. According to the USDA, the products subject to recall bear establishment number “P-7221” on the back of the product package. For product clarification, the last two digits of the product case codes correspond to the hour produced and will match the first two numbers of the time stamp (as depicted on the label). These items were shipped to retail locations nationwide and for institutional use in locations in Michigan and Washington. In general, if plastic or metal fragments are ingested, they could cut the mouth, stomach or other parts of the GI tract, cause intestinal perforation or serious infection and possibly require surgical intervention for their safe removal. If you believe you have purchased or have in your possession the recalled Chicken products, please do not consume them directly nor use them as an ingredient in another dish or preparation. Instead, kindly return the product to the store where you purchased it for a full refund. ==> If you have a medical emergency, please contact 9-1-1, your closest hospital or emergency center equipped to handle internal lacerations. ==> To see other recalls and notifications caused by contaminated, adulterated or mislabeled Chicken products, please search for “chicken” using the Search Box at the top of this page. If you have any questions about this recall notification, please contact Tyson Foods Consumer Relations toll-free at 1-866-886-8456 during normal business hours, Eastern Standard Time, Monday to Friday. ==> To see other recalls and notifications for products manufactured, marketed and/or sold by Tyson Foods, Inc., please search for “Tyson” using the Search Box at the top of this page.